“I Am Lost” is inspired by Matthew 18:11 (also Luke 19:10) …For the Son of man is come to save that which was lost. This song is a vocal solo in easy-listening jazz style. The piano accompaniment can be expanded to include double bass or electric bass, jazz or acoustic guitar, drums played softly with wire brushes, and a soft solo instrument, such as flute or muted trumpet. To see the score or to purchase, click here. 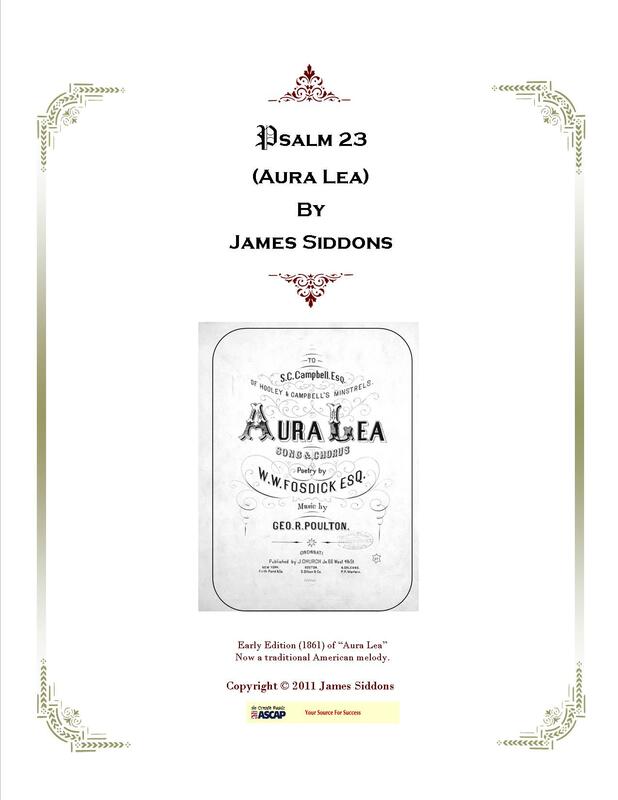 Psalm 23 (Aura Lea) --- This song features the traditional translation of Psalm 23 (KJV) set to the melody of the Civil War-era tune "Aura Lea." The title page shown above has the original 1861 title page of "Aura Lea" in the center. The piano accompaniment by composer/pianist James Siddons (2011) evokes the sound of pianos of a century ago in wooden churches and small music halls. To see the score or to purchase, click here. 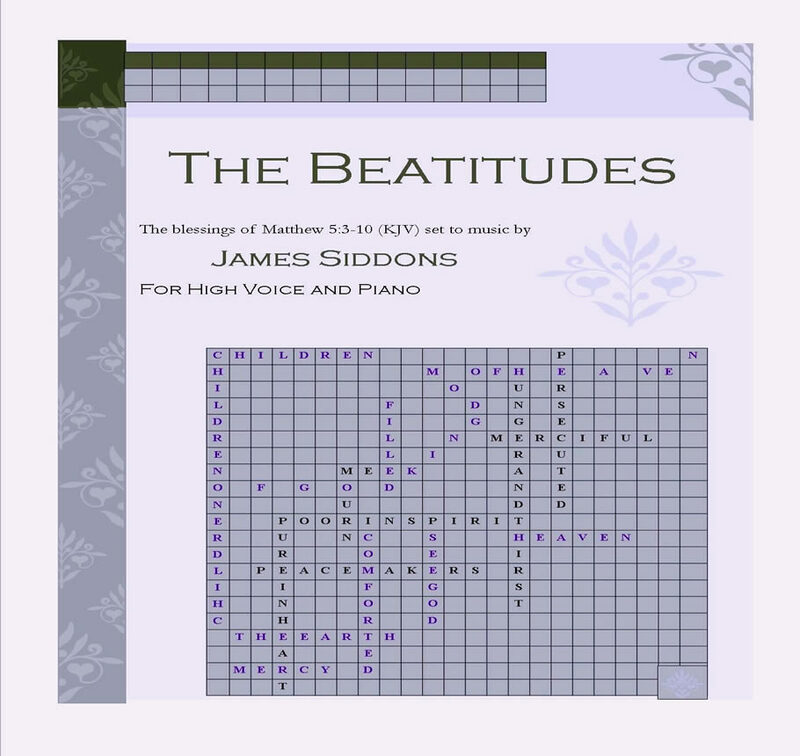 "The Beatitudes" begins with a meditative litany for singer and keyboard or band, and builds to a joyous climax on the words "Rejoice, and be glad," repeated as many times as appropriate, with congregation joining in if desired. Appropriate for youth events with large attendance as well as regular worship. The words are those of Matthew 5:3-10 and 12a (KJV). 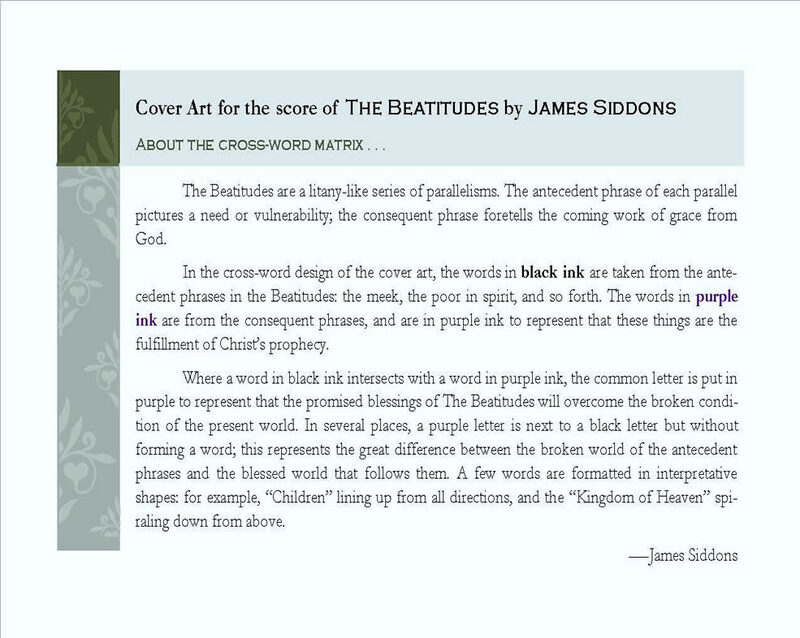 A unique feature of this composition is the cover art created by James Siddons for the titlepage, showing a cross-word matrix that interprets the key words found in The Beatitudes (see below). To see the score, or to purchase, click here. "Jump and Shout It Out!" is a fast and energetic song for praise worship. Ideal for large youth events. To see the score, or to purchase, click here. "Gone Up" is an energetic setting for a contemporary Christian music group of Psalm 47. Both the music and the lyrics, a paraphrase of Psalm 47, are by James Siddons. "Gone Up" can be performed by any combination of singers, keyboards, guitars and/or drums that a contemporary Christian or Jewish worship team might have. To see the score or to purchase, click here. "More Love to Thee, O Christ" --- William H. Doane’s beautiful melody of 1870 is set for handbells with piano accompaniment by James Siddons. The piano part presents a gently undulating arpeggio in 3+3+2 rhythm. There are several versions of this arrangement. For a setting calling for handbells and piano, in which the bells may be played by a soloist or several bell ringers, click here. For a setting of the same musical arrangement, but calling for handchimes and piano accompaniment, click here. For viola solo with piano accompaniment, click here. "I Wonder As I Wander" is a traditional Christmas song from the Appalachian region of the United States. This setting by James Siddons calls for both handbells and handchimes to play with the piano. The mood is soft and quiet, appropriate for Christmas Eve music or for Advent worship. To see the score or to purchase, click here. "Everyday Miracles" --- In Psalm 91:11-12, God promises to send His angels to watch over us. That is a wonderful miracle, but what about little acts of grace that anyone can do? Composer James Siddons provides a look at "everyday miracles" that happen all around us. To see the score, or to purchase, click here. 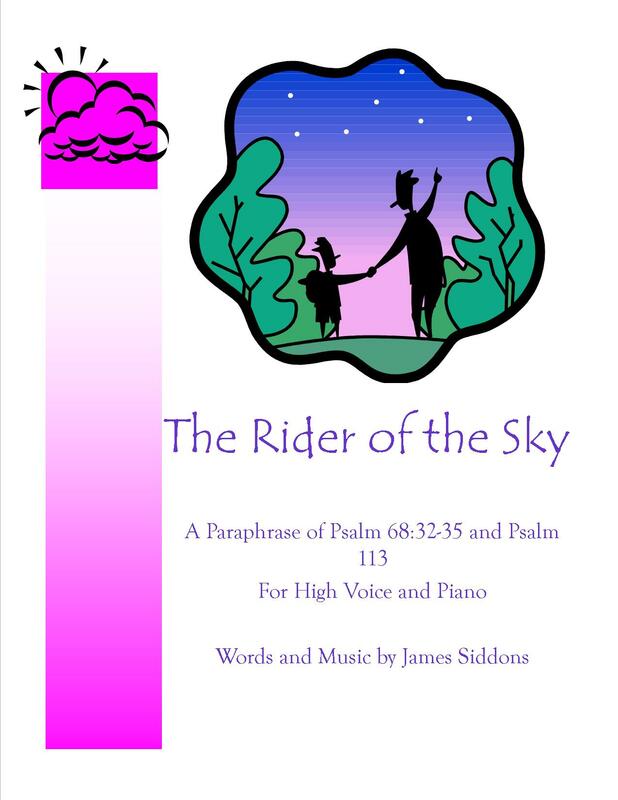 "The Rider of the Sky" --- A dramatic song for recital or worship performance in neo-Baroque style, with a recitative followed by an aria that is based on the Toccata in Widor’s Organ Symphony V. The words are Psalm 68:32-35, and a paraphrase of Psalm 118 by the composer. The piano accompaniment evokes the tone colors of the harpsichord and the pipe organ. This is one of a series of works by composer James Siddons setting the Psalms to music in a variety of forms and styles. The title page (by James Siddons) is shown below. To see the score, or to purchase, click here. "Psalm 146 / Singing praise to the God of the lowly" is for SATB choir and organ, and is in a contemporary liturgical idiom that draws on Jewish cantillation. The text is Psalm 146:1-2 and 7c-10. There are solo passages that are sung by alto, or alto/tenor in alternation, or by the entire alto or tenor section. The organ part calls for three distinct registrations, one of which mimics an early 2oth-century theater organ, such as was heard accompanying silent motion pictures. To see the score, or to purchase, click here. "More Love to Thee, O Christ" for viola solo and piano accompaniment. This is the same music as the handbell setting of this 1870 hymn (see above), transcribed for viola and piano. Difficulty: Level 2 to 3. To see the score, or purchase, click here.